One of our West Gloucester readers, DB, spotted a Giant Swallowtail in her garden! She was too surprised by its appearance to take a photo, and I completely understand why. They are fantastically large in size, as large as a Cecropia Moth. 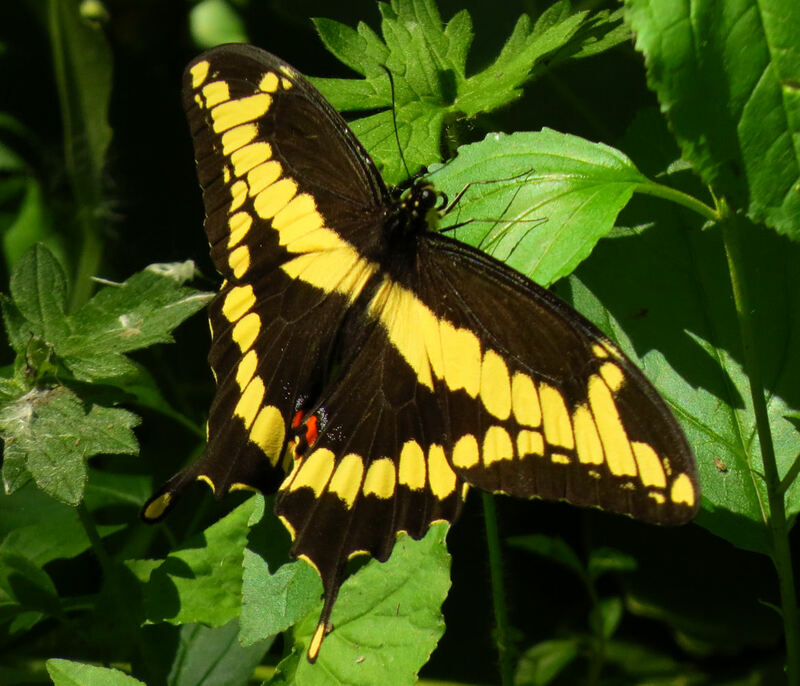 Giant Swallowtails are more of a southern species, but sometimes make it this far north and east, especially during long stretches of hot, humid weather. Readers, please keep your eyes peeled, and if you can, try to get a snapshot, and please let us know of your sighting. 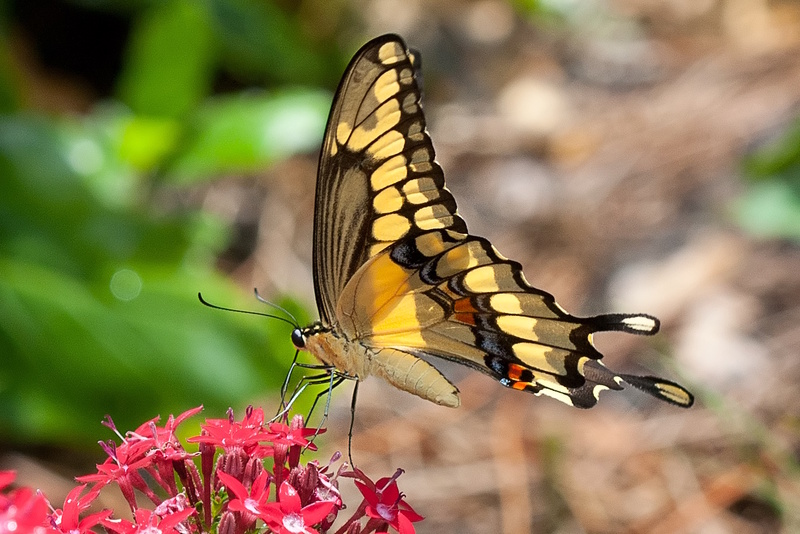 Look for Giant Swallowtails nectaring in your garden; they especially love native Marsh Milkweed, tropicals such as lantana and bougainvilla, also butterfly bushes, Wild Sweet William, and honeysuckle. I have only see one once in my garden (in 2012) and it was drinking nectar from the lantana growing in pots on my patio. By the time I ran indoors and back to the garden with camera, the Giant Swallowtail was gone. The photos are from wiki commons media so you can id the butterfly if you see one in your garden. Happy spotting! The yellow will be paler on an older butterfly as the scales wear off, but look for the arrangement of the spots for an id. 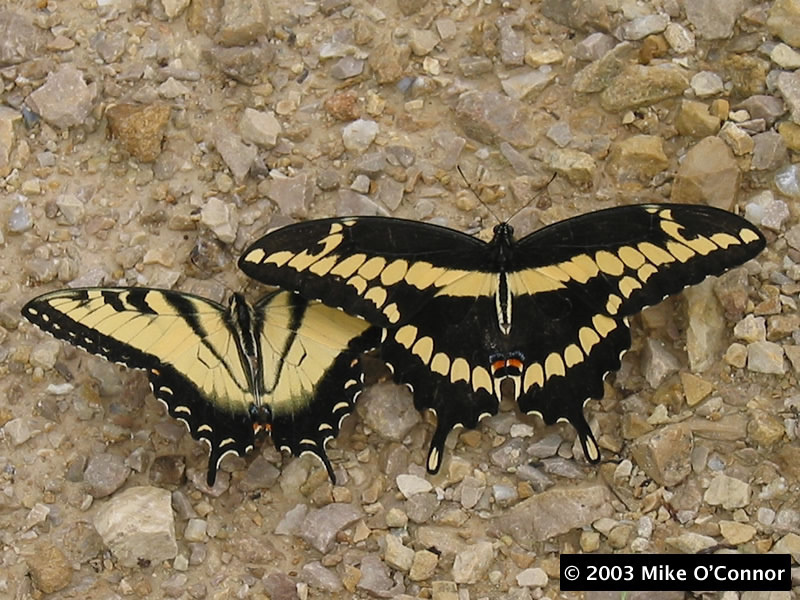 Giant Swallowtail Butterflies, with a wingspan of up to 6.5 inches across, are noticeably larger than Eastern and Canadian Tiger Swallowtails (Eastern Tiger Swallowtail, left, Giant Swallowtail, right). This entry was posted in Butterflies of Cape Ann, Butterflies of Massachusetts, Butterflies of New England, Butterfly Garden, Lepidoptera ~ Butterflies, Skippers, and Moths, Life at the Edge of the Sea and tagged Canadian Tiger Swallowtail, Eastern Tiger Swallowtail, Giant Swallowtail Butterfly, Giant Swallowtail Butterfly Massachusetts, Papilio canadensis, Papilio cresphontes, Papilio glaucus, West Gloucester MA on August 12, 2018 by Kim Smith.